What Is It About Freedom That Scares Them So? I've been going back through some of my older videos, and checking out some of the pictures of the Tea Party protests over the last 14 months or so, and something struck me. The messaging that is used by the majority of the Tea Party is about pro-American values. 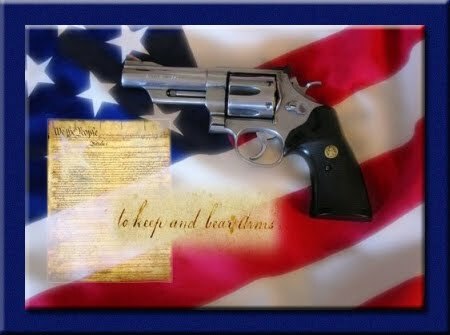 You see words like Liberty, Freedom, and the Constitution. You see Flags and colonial gear meant to evoke the glorious nature of our founding. You hear words like "deficit spending," "accountability," "vote them out," and complaints about a Congress out of touch with the common man, rewarding the connected with the work of those who are not connected. And yet - something in those words - something in those concepts is so frightening to the Left they feel they must destroy us personally instead of engaging in the issues or lifting up the politicians of their own side. 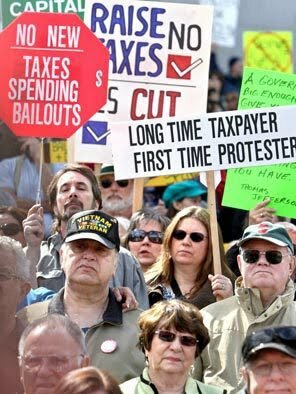 The vitriol spewed against citizens with very little political clout is instructive. They don't attack the politicians - they attack the Tea Parties. What are they afraid of? The use of the word freedom? Cutting spending so as not to ruin the nation with a financial crash? Demanding our representatives read the bills they legislate on and not pass multi-trillion dollar debacles with bribes? Freedom. That's what it comes down to. The simplistic and childish nature of the progressive rants is based on their terror of freedom. 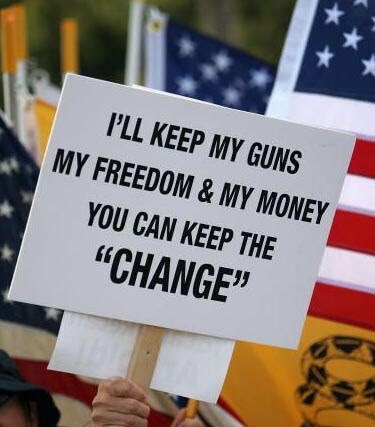 If they cannot take our money, they cannot control their voters. If they cannot convince us, they must attack us and force us to leave the debate out of fear for our families, or our personal safety. Ask yourself something - what kind of people are afraid of freedom? We need to take control of the messaging and start forcing the Left to answer. They don't care what we do or say - they just want control. Of you, your work, your sweat, your business, your healthcare, your company, and even your thoughts. A free mind is the most terrifying thing they can think of. Those who think for and take care of themselves, have no need for self-important bureaucrats unable to make it without the power of the government behind them. MACON - The Missouri Department of Transportation (MoDOT) has announced that it is preparing to temporarily close both the eastbound and westbound lanes of US Route 36 to traffic today between Macon and Monroe City. The temporary closure is expected to begin mid-morning and continue for several hours. During the temporary closure eastbound traffic on US Route 36 will be detoured to US Route 63 at Macon to US Route 24 at Moberly to US Route 36 at Monroe City. Westbound traffic on US 36 will be detoured to US Route 24 at Monroe City to US Route 63 at Moberly to US Route 36 at Macon. Lighted message boards to alert motorists of the detour will be placed on US Route 36 at Chillicothe, Macon, Monroe City and Hannibal and on US Route 24 at Moberly. MoDOT will issue a press release prior to the actual closing of US 36. Latest update is that he is coming in on a tour bus out of Quincy (when with this guy realize he's NOT a rock star!?) They are closing down 36 at 10:30 this morning. If you get here after that there are alternate routes to get to K & 36 shown on the map above. A farmer has given us permission to stand along his field on the NORTHWEST CORNER. He's also given us permission to park on the gravel areas of the farmhouse on K, just north of 36 on the east side of the road. The media will be set up at the CDL lot on the corner but they said it wouldn't be a problem for us to walk thru to get to where we're going to be standing. PLEASE, be considerate of this farmer and respect the area's he's given us permission to use. Keep it clean and don't go off the designated areas. We've had 3 straight days of rain so please park on the graveled areas. And if you see any trash help us keep it picked up. When we're up on the edge of his land, that field has just been planted. Again, 3 days of rain it's deep mud, so please stay only in the grassy areas. We are the only ones who have permission to be there, again on private property. 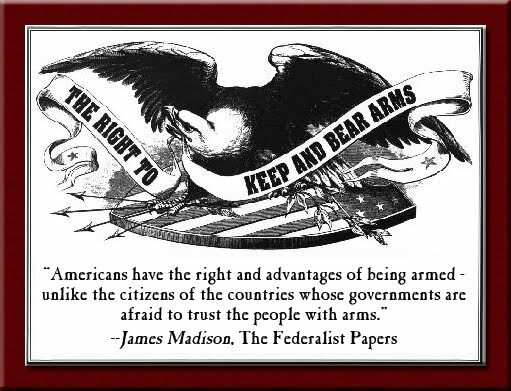 If there are any intruders we have the right to ask to have the law enforcement remove them. We all have cell phones and we know how to use them! Try to get up there by 10:00. Stand Up! Let your voices be heard!! Bring your signs, bring your lawn chairs and get ready to settle in for a time with our northern county farmers and business owners who have something to say to the President. We know that he is coming to assure us that he has a plan for jobs for Main Street America. But we know that the other hand is holding more regulations for our farmers and businesses that will create more federal government jobs and union power holds for his own. We have an evening of excellent speakers and information for concerned citizens starting at 6:00pm. behavior, or language will be asked to leave. If at all possible, please carpool. We're expecting this to be a huge event. We have plenty of parking and there will be attendants directing all traffic. Today is sunny and beautiful, but the grounds will still be wet. 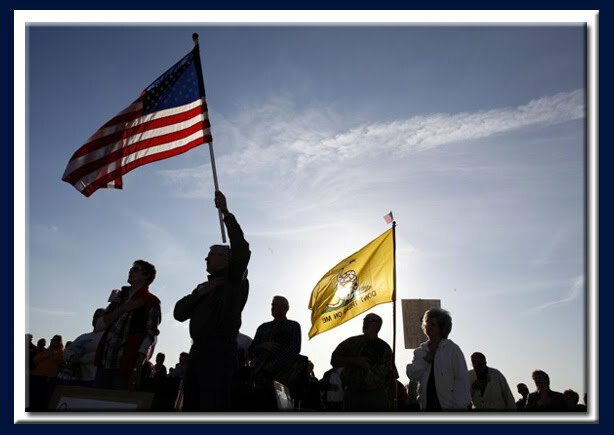 We will be coordinating with Missouri As A Mom, 9/12 Project, Americans 4 Prosperity and other groups, to line the roads to the ethanol plant to welcome the President to Rural America with our voices (signs) once again. A defined time and place to meet will be announced at the Rally on Tuesday evening. We have 2 days of events going on for North Missouri to stand up and be heard! Stand Up! Let your voices be heard!! Bring your signs, bring your lawn chairs and get ready to settle in for a time with our northern county farmers and business owners who want to tell the President to stop the strangle hold of endless regulations and taxing. We have no more wealth for him to redistribute out of Rural America! We will be coordinating with Missouri AsAMom to line the roads to the ethanol plant to welcome the President to Rural America with our voices (signs) once again. Please check back as we update information as quickly as we receive it. 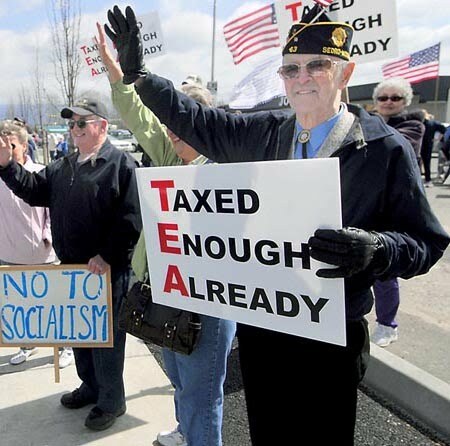 It's what the heart of the Tea Party has always been, since day one. Star Parker is the founder and president of CURE, the Coalition on Urban Renewal & Education, a 501 c3 non-profit think tank that provides a national voice of reason on issues of race and poverty in the media, inner city neighborhoods, and public policy. Prior to her involvement in social activism, Star Parker was a single welfare mother in Los Angeles, California. After receiving Christ, Star returned to college, received a BS degree in marketing and launched an urban Christian magazine. The 1992 Los Angeles riots destroyed her business, yet served as a springboard for her focus on faith and market-based alternatives to empower the lives of the poor. As a social policy consultant, Star Parker gives regular testimony before the United States Congress, and is a national expert on major television and radio shows across the country. Currently, Star is a regular commentator on CNN, MSNBC,and FOX News. She has debated Jesse Jackson on BET; fought for school choice on Larry King Live; and defended welfare reform on the Oprah Winfrey Show. 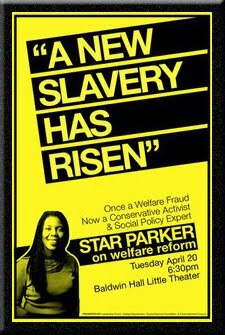 Star Parker's personal transformation from welfare fraud to conservative crusader has been chronicled by ABC's 20/20; Rush Limbaugh; Readers Digest; Dr. James Dobson; The 700 Club; Dr. George Grant; the Washington Times; Christianity Today; Charisma, and World Magazine. Articles and quotes by Star have appeared in major publications including the Wall Street Journal, Washington Post, and New York Times. Star has written three books. Her autobiography Pimps, Whores & Welfare Brats was released in 1997 by Pocket Books, Uncle Sam's Plantation was released by Thomas Nelson in the fall of 2003, and White Ghetto: How Middle Class America Reflects Inner City Decay was released in 2006.
and the Funds Allotment Council. Barack Obama is the best thing that has happened to America in the last 100 years. Truly, he is the savior of America's future. He is the best thing ever. Despite the fact that he has some of the lowest approval ratings among recent presidents, history will see Barack Obama as the source of America's resurrection. Barack Obama has plunged the country into levels of debt that we could not have previously imagined; his efforts to nationalize health care have been met with fierce resistance nationwide; TARP bailouts and stimulus spending have shown little positive effect on the national economy; unemployment is unacceptably high and looks to remain that way for most of a decade; legacy entitlement programs have ballooned to unsustainable levels, and there is a seething anger in the populace. That's why Barack Obama is such a good thing for America. Average Americans who have quietly gone about their lives, earning a paycheck, contributing to their favorite charities, going to high school football games on Friday night, spending their weekends at the beach or on hunting trips — they've gotten off the fence. They've woken up. There is a level of political activism in this country that we haven't seen since the American Revolution, and Barack Obama has been the catalyst that has sparked a restructuring of the American political and social consciousness. Think of the crap we've slowly learned to tolerate over the past 50 years as liberalism sought to re-structure the America that was the symbol of freedom and liberty to all the people of the world. Immigration laws were ignored on the basis of compassion. Welfare policies encouraged irresponsibility, the fracturing of families, and a cycle of generations of dependency. Debt was regarded as a tonic to lubricate the economy. Our children left school having been taught that they are exceptional and special, while great numbers of them cannot perform basic functions of mathematics and literacy. Legislators decided that people could not be trusted to defend their own homes, and stripped citizens of their rights to own firearms. Productive members of society have been penalized with a heavy burden of taxes in order to support legions of do-nothings who loll around, reveling in their addictions, obesity, indolence, ignorance and “disabilities.” Criminals have been arrested and re-arrested, coddled and set free to pillage the citizenry yet again. Lawyers routinely extort fortunes from doctors, contractors and business people with dubious torts. In the time of Barack Obama, Black Panther members stand outside polling places in black commando uniforms, slapping truncheons into their palms. ACORN — a taxpayer-supported organization — is given a role in taking the census, even after its members were caught on tape offering advice to set up child prostitution rings. A former Communist is given a paid government position in the White House as an advisor to the president. Auto companies are taken over by the government, and the auto workers' union — whose contracts are completely insupportable in any economic sense — is rewarded with a stake in the company. Government bails out Wall Street investment bankers and insurance companies, who pay their executives outrageous bonuses as thanks for the public support. Terrorists are read their Miranda rights and given free lawyers. And, despite overwhelming public disapproval, Barack Obama has pushed forward with a health care plan that would re-structure one-sixth of the American economy. I don't know about you, but the other day I was at the courthouse doing some business, and I stepped into the court clerk's office and changed my voter affiliation from “Independent” to “Republican.” I am under no illusion that the Republican party is perfect, but at least they're starting to awaken to the fact that we cannot sustain massive levels of debt; we cannot afford to hand out billions of dollars in corporate subsidies; we have to somehow trim our massive entitlement programs; we can no longer be the world's policeman and dole out billions in aid to countries whose citizens seek to harm us. Literally millions of Americans have had enough. They're organizing, they're studying the Constitution and the Federalist Papers, they're reading history and case law, they're showing up at rallies and meetings, and a slew of conservative candidates are throwing their hats into the ring. Is there a revolution brewing? Yes, in the sense that there is a keen awareness that our priorities and sensibilities must be radically re-structured. Will it be a violent revolution? No. It will be done through the interpretation of the original document that has guided us for 220 years — the Constitution. Just as the pendulum swung to embrace political correctness and liberalism, there will be a backlash, a complete repudiation of a hundred years of nonsense. 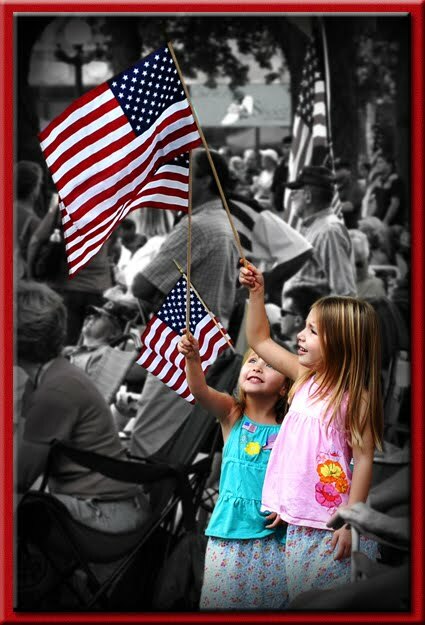 A hundred years from now, history will perceive the year 2010 as the time when America got back on the right track. And for that, we can thank Barack Hussein Obama. 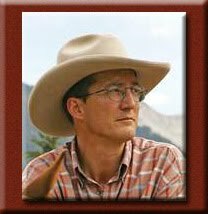 A hunter, rancher, and former hunting and fly-fishing guide. Gary works as a Colorado ranch real estate broker. And, in my opinion, a real "The glass is half full" kinda guy that we need in these days!